Aims: To characterise the clinical manifestations of late presenting Bochdalek diaphragmatic hernia (DH), the incidence of misdiagnosis, and prognosis; and to explore the sequence of events that leads to this clinical picture. Methods: Retrospective chart review. All children with Bochdalek DH were identified. Children 1 month of age and older at the time of diagnosis were included. Results: Twenty two children with Bochdalek DH met the inclusion criteria. Three clinical presentations could be defined. Fourteen children presented with acute onset of symptoms, predominantly vomiting and respiratory distress. Four had chronic non-specific gastrointestinal or respiratory symptoms, and in four the DH was found incidentally. Although five children were initially misdiagnosed, in 20 children (91%) the correct diagnosis was made on x ray examination. One child experienced a complicated course when the x ray picture was misinterpreted as pneumothorax. All children had favourable outcome. Two children had previously normal chest imaging, suggesting acquired herniation. A large pleural effusion without DH in a 9.5 year old girl with an abdominal infection prior to presenting with herniation suggests a pre-existing defect in the diaphragm. Conclusions: Late presenting Bochdalek DH can present with acute or chronic gastrointestinal, or less frequently, respiratory symptoms. It can also be found incidentally. Misdiagnosis can result in significant morbidity. Favourable outcome is expected when the correct diagnosis is made. The sequence of events is probably herniation of abdominal viscera through a pre-existing diaphragmatic defect. Although rare, DH should be considered in any child presenting with respiratory distress or with symptoms suggestive of gastrointestinal obstruction. The pathophysiology of this phenomenon is not clear. Reports of DH with a previously normal x ray examination have led to the conclusion that these hernias may be acquired through a congenital defect in the diaphragm. The objectives of this study were to characterise the clinical presentation of late presenting DH, assess the incidence of misdiagnosis and its consequences, and determine its prognosis. Based on this information we hoped to characterise the sequence of events that leads to this clinical picture. We searched hospital records for all children hospitalised with diaphragmatic hernia (ICD 9 code 553.3, 756.6) or children who had their diaphragm repaired (ICD 9 code 53.7, 53.80) between April 1988 and December 2000. All children less than 1 month old and children with eventration of the diaphragm or Morgagni, hiatal and paraoesophageal hernias were excluded. Descriptive statistics were used to describe demographic data. Student’s t test or the Mann-Whitney U test was used, as appropriate, for continuous variables. Results are given as mean (SD) or median and range, as appropriate. A p value of less than 0.05 was considered significant. A total of 199 children were identified with Bochdalek DH, 22 of whom had late presenting DH (11%). All charts were available for review. The median age at presentation was 13 months (range 2 months to 12.5 years). Nineteen (86%) had left and three (14%) had right sided hernias. Fourteen were boys and eight were girls. Children with acute onset of symptoms. Fourteen children (aged 2 months to 12.5 years) presented with acute symptoms of 0–5 days duration. Twelve of them were unwell on admission. Nine presented with vomiting (two bilious). One of these had bloody diarrhoea. Respiratory symptoms (respiratory distress, tachypnoea, and cyanosis) were present in five. One child had acute onset of chest pain while playing rugby. He experienced similar pain, which subsided quickly six weeks earlier after falling from a snowboard. None had chronic symptoms suggestive of DH (table 1). Children with chronic symptoms. Four children presented with chronic non-specific complaints. Three children (aged 2–10 years) had chronic abdominal pain and constipation; one was treated with repeated courses of enemas and laxatives, and one had episodes of bloody stool as a baby, which were attributed to lactose intolerance. An abdominal x ray examination was performed later in the course of the symptoms, establishing the diagnosis of DH. The fourth child (aged 2 months) presented with intermittent tachypnoea one month prior to admission, which worsened on the day of admission (table 1). Asymptomatic children with incidental finding of DH. Four children aged 6 months to 9.5 years underwent x ray examination for other reasons (unexplained fever or findings on physical examination). Two had right DH and two left DH. All had elective repair of the hernia (table 1). There was no significant association between age at diagnosis and the clinical presentation (median age of children with respiratory symptoms was 5 months (range 2 months to 12.5 years) and median age of children with gastrointestinal symptoms was 23 months (range 2 months to 10 years); p = 0.25). The diagnosis in all children was made by chest x ray examination (fig 1), which was performed in symptomatic children with respiratory symptoms, clinical suspicion of bowel obstruction, or findings on physical examination (bowel sounds in the thorax on auscultation, abdominal tenderness). Two children were diagnosed initially with pneumonia, one of them because of misinterpretation of the chest x ray picture. The diagnosis of DH was established only after the patient failed to respond to treatment. Two children had recurrent physician visits until a chest x ray examination was performed, leading to the correct diagnosis of DH. Of the 22 children, 19 had a benign course prior to the operation. The other three children experienced rapid onset of shock. All three required ventilatory and circulatory support. One of them presented with vomiting and deteriorated while in the emergency room. He was found to have a necrotic bowel at operation. The other two presented with severe respiratory distress. One of them, a 4.5 year old boy, presented to a community hospital in respiratory distress. A chest x ray examination was performed showing air in the left hemithorax with mediastinal shift to the right. Gastric air was misinterpreted as pneumothorax and a chest tube was inserted. Gastric fluid was drained from the tube. The child deteriorated quickly, developed septic shock, and was transferred to our hospital. His hernia was repaired. He had a complicated postoperative course including the development of a lung abscess, pleuropneumonia, and staphylococcal sepsis. A 15 month old boy presented with restlessness. Bowel sounds were heard on auscultation in the left hemithorax. Chest x ray examination confirmed the diagnosis of DH. The diameter of the diaphragmatic defect ranged from 2 to 10 cm. All of the defects were described by the surgeon as having a peritoneal covering suggestive of congenital origin, and none had gross evidence of inflammation which would have been seen in the setting of a traumatic diaphragmatic injury. The most common herniated viscera in left sided DH were colon and small bowel, followed by stomach and spleen. Right sided defects usually contained liver and colon (table 2). Gastric volvulus was found in one child and gastric perforation secondary to chest tube insertion in another. One had necrotic small bowel, which was resected. One child was found to have an ischaemic caecum; however, it recovered spontaneously intraoperatively without need for resection. All hernias were repaired using a lateral subcostal approach. A thoracotomy was performed in one child with right sided DH in whom the liver was incarcerated within the hernia. All defects were repaired primarily except for one large left sided defect, which required a Gore-Tex patch. An associated lung cyst was found in one child and was unroofed. Pathological examination could not determine the nature of the cyst. Twenty of the 22 children (91%) had an uneventful postoperative course (mean hospital stay post operation 5.4 (SD 1.5) days). However, one child in this group developed pneumonia and another child developed abdominal distension with Enterobacter cloacae sepsis. Both complications resolved with antibiotic therapy within a few days. Two children (9%) had prolonged complicated courses. Both had cardiopulmonary compromise at presentation. One of them had gastric perforation secondary to a chest tube inserted to his stomach. His course was complicated by lung abscess with pleuropneumonia and Staphylococcus epidermis sepsis. He was discharged three weeks after his operation. The other child, who had necrotic bowel requiring jejunal resection, had three episodes of sepsis postoperatively, and was discharged after two months. Three children were readmitted to the hospital 1–3 months after discharge with abdominal pain and vomiting. Partial intestinal obstruction was suspected in all. All resolved with non-operative treatment. All children were seen in the surgical follow up clinic. Median time of follow up was 2.5 years (range 1 month to 8 years). No long term sequelae were observed in any of the patients. All children were previously healthy. Two children had previous x ray examinations. One was an 11 month old child who had a normal chest x ray examination at 2 months of age. The other was a 9.5 year old girl who initially presented with periappendiceal abscesses. The abscesses were drained under ultrasound guidance. Her course was complicated by a very large left pleural effusion that required drainage. Chest computed tomography (CT) performed after the pleural fluid was drained showed a slightly elevated left diaphragm with no herniation of abdominal viscera into the thorax (fig 2A). As she continued to be symptomatic, an appendectomy was performed. She presented one month later with abdominal pain and bilious vomiting. A left sided DH was seen on chest x ray examination and chest CT, with bowel loops seen in the left hemithorax up to the apical area (fig 2B). At operation a large diaphragmatic defect was found, with all of the transverse colon and most of the omentum herniated into the chest. A 9.5 year old girl presented with periappendiceal abscess accompanied by a large pleural effusion, which was drained. Chest CT at that time did not show any abdominal viscera within the thorax (A). She presented one month later with abdominal pain and bilious vomiting. A chest CT at that time showed bowel loops (arrowheads) within the thorax (B). Bochdalek DH usually presents in the neonatal period as severe respiratory distress. However, late presenting DH has been described in the literature, and is usually associated with a better outcome. Incidence varies between 5% and 25% of all Bochdalek DH.6–8 In 1988, Berman et al reported an incidence of 10% in a retrospective analysis of 26 cases from our institution, with a yearly incidence of 1.3 cases.6 We have had 22 new cases since that series, representing 11% of the children with DH presenting to our hospital, with an incidence of 1.7 cases per year. The higher incidence in the more recent series might represent an increased use of imaging in asymptomatic children or children with mild symptoms, or may represent an increased rate of referrals to our hospital. Three types of clinical presentation could be distinguished, suggesting that the timing of herniation might vary. The largest group presented with acute onset of symptoms, which might suggest acute herniation prior to presentation, or acute incarceration of previously herniated bowel. The other two groups had either chronic symptoms or no symptoms, both consistent with herniation that occurred long before presentation. The question of chronic symptoms was specifically addressed in all cases, although it is possible that detailed past medical history for these symptoms might have been incomplete in this retrospective study. Wiseman and MacPherson reported three cases of late presenting Bochdalek DH and reviewed another 14 cases reported earlier, all of whom had a previously normal chest x ray examination. They concluded that these hernias are acquired.1 The clinical picture and the previous normal imaging in our study support this conclusion. Although the herniation in these cases appeared later in life, the question of whether the diaphragmatic defect itself is congenital or acquired remained unsolved. It has been assumed that the defect was present prenatally, but is small and occluded by liver or spleen.8 Acquired diaphragmatic defects have also been described in association with trauma,10,11 but this is probably a rare event in the population of children with late presenting Bochdalek hernias. None of our cases had intraoperative findings suggestive of a traumatic aetiology. Hight et al reported an intermittent DH, with recurrent herniation of abdominal contents into the chest, suggesting that a diaphragmatic defect can be present without herniation of the abdominal viscera.3 In two of our cases there was evidence to suggest that the defect existed prior to the herniation. One child presented with peritoneal infection with a very large pleural effusion weeks prior to the herniation. The amount of pleural effusion was much larger than expected in a reactive effusion to an abdominal infection, suggesting that the peritoneal fluid spread to the left hemithorax through the existing diaphragmatic defect. The bowel likely herniated through this defect in the following month, perhaps after the viscera occluding the defect had been moved by the inflammatory process. Another child presented with acute chest pain while playing, similar to a pain he experienced weeks earlier while falling, suggesting recurrent herniation. Previous reports found respiratory symptoms to be the most common presentation, followed by gastrointestinal symptoms. Newman et al suggested that younger children present with the former, while older ones have the latter.8 We found that gastrointestinal symptoms were more common than respiratory symptoms, both in the acute and the chronic presentation. We did not find an association between age and clinical presentation. Misdiagnosis of late presenting DH is often reported. Although pneumonia is frequently the initial incorrect diagnosis in these children, and was previously reported in up to 62% of patients with DH,6 it is usually not associated with severe morbidity. In contrast, an incorrect diagnosis of tension pneumothorax was associated with significant morbidity.5,6 Berman et al had four of 26 children (15%) diagnosed with tension pneumothorax.6 A chest tube was inserted in all of them. However, the consequences of these chest tube insertions were not described. We had only one child, in whom a chest tube was inserted, resulting in gastric perforation with a severe prolonged course. In 20 of 22 children (91%), DH was suspected when the chest x ray picture was first interpreted, representing an improvement over previously reported series. Mortality of late presenting Bochdalek DH ranged from 8% to 18% in series published in the 1970s and 1980s.1,6 In our series all children recovered with no long term sequelae. This is probably the result of a lower rate of misdiagnosis and improved surgical and intensive care techniques. We conclude that late presenting Bochdalek DH can present with acute as well as chronic respiratory and gastrointestinal symptoms, or can be present in asymptomatic individuals. The sequence of events is probably prenatal or postnatal herniation of abdominal viscera through a pre-existing diaphragmatic defect, which may occur long before the child becomes symptomatic. Bochdalek DH should be considered in the differential diagnosis of every child presenting with acute respiratory distress, especially when extrapulmonary air is seen within the chest on x ray exaination. It should also be considered in children presenting with symptoms suggestive of gastrointestinal obstruction or those who present with chronic non-specific symptoms. Although prognosis is generally favourable, delayed diagnosis can result in significant morbidity. Wiseman NE, MacPherson RI. 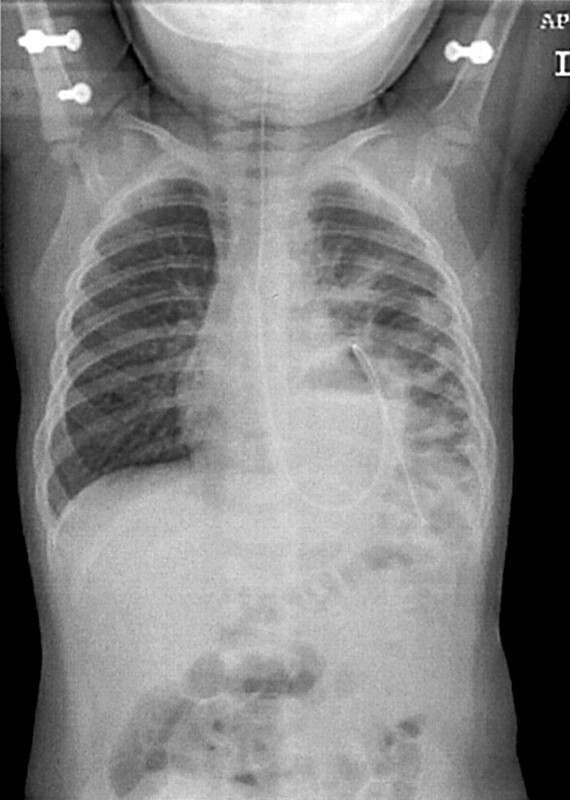 “Acquired” congenital diaphragmatic hernia. J Pediatr Surg1977;12:657–65. Heij HA, Bos AP, Hazebroek FW. “Acquired” congenital diaphragmatic hernia. Eur J Pediatr1987;146:440–1. Hight DW, Hixsoh SD, Reed JO, et al. Intermittent diaphragmatic hernia of Bochdalek: report of a case and literature review. Pediatrics1982;69:601–4. Glasson MJ, Barter W, Cohen DH, et al. Congenital left posterolateral diaphragmatic hernia with previously normal chest x-ray. Pediatr Radiol1975;3:201–5. Fein JA, Loiselle J, Eberlein S, et al. Diaphragmatic hernia masquerading as pneumothorax in two toddlers. Ann Emerg Med1993;22:1221–4. Berman L, Stringer D, Ein SH, et al. The late-presenting pediatric Bochdalek hernia: a 20-year review. J Pediatr Surg1988;23:735–9. Osebold WR, Soper RT. Congenital posterolateral diaphragmatic hernia past infancy. Am J Surg1976;131:748–54. Newman BM, Afshani E, Karp MP, et al. Presentation of congenital diaphragmatic hernia past the neonatal period. Arch Surg1986;121:813–69. Johnson DG, Deaner RM, Koop CE. Diaphragmatic hernia in infancy: factors affecting the mortality rate. Surgery1967;62:1082–91. Jacobs BC, Senac MO, Wood BP. Radiological cases of the month. Bochdalek hernia after trauma. Am J Dis Child1993;147:69–70. Nursal TZ, Ugurlu M, Kologlu M, et al. Traumatic diaphragmatic hernias: a report of 26 cases. Hernia2001;5:25–9. Shah AV, Shah AA. Laparoscopic approach to surgical management of congenital diaphragmatic hernia in the newborn. J Pediatr Surg2002;37:548–50.